After 40 years combined experience of our directors within the IT and audio visual industry, particularly in the education sector, we have unparalleled knowledge of products, technical specifications, new technologies and installation procedures in the audio-visual and IT world. With the ongoing squeezing of budgets in schools we innovate constantly for our clients, check our prices daily and liaise closely with schools, colleges and universities to ensure that money is well spent. Our project managers, trained engineers and obsession with quality ensure that you get a seamless, expert installation with no mess or hassle. It’s what our clients like most about what we do. At Protech Solutions we can offer you peace of mind in the fact that not only do we have a team of experienced in-house engineers who are all fully DBS checked, but we also offer a free of charge, full after-care service for any issues which you may experience post installation, including on-site if needed. All our engineers are fully qualified, follow the PAS 122:2009 installation guidelines and are all DBS checked and cleared to work in schools and among vulnerable members of society. Our engineers are experts in their field, fully trained and have a minimum of one year’s experience within the industry. We are also very sensitive to the restrictions sometimes presented with working in a school or college environment and our work is carried out in an efficient, respectful manner in order to ensure minimum disruption to the setting and it’s students. If you have an idea of your requirements we’ll have great ideas for how to deliver them within your budget. From Smartboards and Clevertouch LED touchscreens to Epson projectors and Lenovo and Dell PCs and laptops, we don’t restrict the products and manufacturers we partner with, so that the advice you get is completely objective, up to the minute and cost conscious. 100% satisfaction is not enough – we want to exceed expectations at every step. You are welcome to talk to our customers to hear for yourself how our company performs from start to finish or see our testimonials in the footer of every page. Based in Watford, Hertfordshire, our sales director and installation engineers work across the Home Counties and beyond, where ever our reputation takes us. Buying from us is totally stress-free and absolutely price competitive. From BenQ and Clevertouch, to Iyama and SMART, we can offer solutions to fit your preferred budget and requirements. The advantages of the interactive LED touchscreen include superior picture quality, portability and they are not reliant upon a projector. Some interactive LED touchscreens can also incorporate a PC which therefore creating a compact solution. If you are undecided or unfamiliar with the technology, we can arrange for a demo to be carried out at your site. Just call us on 0844 209 6768 to arrange. 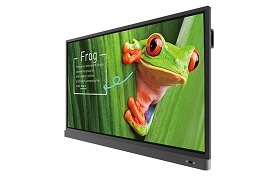 As an alternative to Interactive Screens, we can provide a projection solution in the classroom. Although this is slowly being replaced by interactive panels in a lot of settings, it is still the preferred choice in many schools and education settings. Large scale hall projection is one of our most frequently installed solutions and we can accommodate all requirements and specs. If you have a large hall and a lot of students, being heard during assemblies and school productions and presentations can be a bit of a challenge. We help our schools improve on this by equipping them with transformation sound solutions with lapel or wireless mics and zoned-amps and outside speakers for summer fetes and sports days. 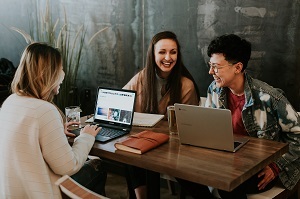 We are accredited suppliers for the likes of Dell, HP and Lenovo and can therefore supply the hardware you need for your staff and students at very competitve prices. 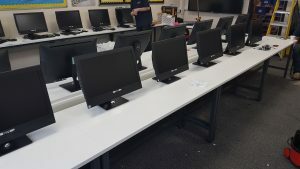 As well as this, we can complete an entire ICT Suite installation including the desking from consultation and design through to supply and installation. Just tell us your preferred spec and we will take care of the rest. We have used Protech on more than one occasion for fibre runs and projector installations. They are always professional, reliable and friendly. On this occasion we got them to survey, quote and install a new projector and screen in our school hall. 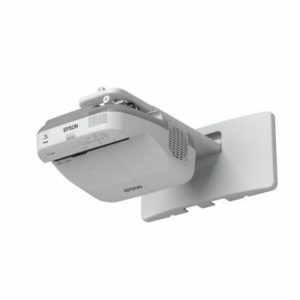 We have had numerous projectors fitted but haven’t been up to the job because of all the ambient light in the room. Paul, the Managing Director, came out and did a survey we me and the Headteacher. We wanted something big and something bright. Protech came back with a 4m by 2.6m fixed frame screen solution with a NEC 6700 lumen projector. Installation only took a few hours. They removed the old equipment and fixed the new. We have been very impressed with the picture quality and image size so far and our… Headteacher is so impressed he has been recommending it to other schools. I just wanted to take this opportunity to thank you for the excellent job that your team did for us on Tuesday. We are truly delighted with the Clevertouch boards. The children are over the moon with them too. Protech Solutions recently installed 5 Promethean ActivPanels in our school. The service we received from quotation to installation was excellent. The engineers were very professional, efficient and clean! We will definitely use Protech again. I just wanted to say that we were really impressed with the job that your guys did on our fibre cabling refresh project this summer. We thought the installers were methodical, tidy, kept to the deadline and were keen to discuss and work through problems with us when they arose. I’ve see a fair range of different ‘quality’ installers over my 12 years here, and I think it’s fair to say that your guys rank among the top of those. Protech Solutions Ltd have been advising Manor Lodge School on audio visual solutions. Based on their recommendations we have updated 15 projectors on Interactive White Boards and in our main hall, installed the first two of the next generation of SmartTech IWBs and solved a few of our other audio visual problems. 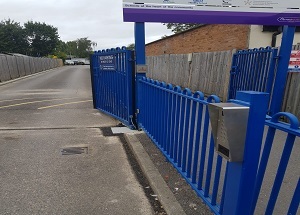 I like dealing with suppliers local to our school that can provide a personal approach, and Protech have done a great job of supplying and installing equipment for us. We have employed Protech’s services regularly over the past few years. The product range, professional workmanship, and customer service are consistently second to none. 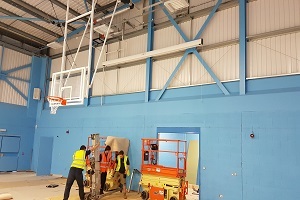 We recently had a major network cabling project undertaken by Protech at very short notice, which was carried out in a thoroughly organised manner, with minimal disruption to the school environment at all times, despite us having provided them with very little time to prepare and plan the project. We would not hesitate for a moment to recommend Protech to other schools and businesses. Protech Solutions recently supplied us with various PCs and Colour Laser Printers. Not only were they very competitive on price, but they were able to deliver the items within a very short timeframe. We are very happy with the items and would definitely use Protech Solutions in the future. Protech Solutions were very professional in carrying out our CCTV installation last week. They were very knowledgeable and advised us on the best solution for us. We are very happy with their work and would not hesitate to use them for any future requirements we might have. We are very happy with their work.